I realize I should be reporting in on our winter adventures. (Apparently we’ve hit the big news as one of my uncles called Dad to give him instructions on how to deal with all this snow!) I’ve been busy though. I’ve had to keep track of the storms. I think it all started when Shaun kept noting that I was haunting the weather stations and blogs. He asked if I thought tracking the weather was like the old saying of “a watched pot never boils”. It made perfect sense to me. Last night there were predictions of a huge windstorm…possibly worse than the one we had two years ago. (You can see some pictures of the aftermath HERE) With Shaun’s words ringing in my ears, I knew that it was up to me to keep a vigil in order to keep that wind far, far away from us. In the end, and with only a little help from Carol the dreaded wind storm didn’t come. We did get snow though. Lots and lots of snow. 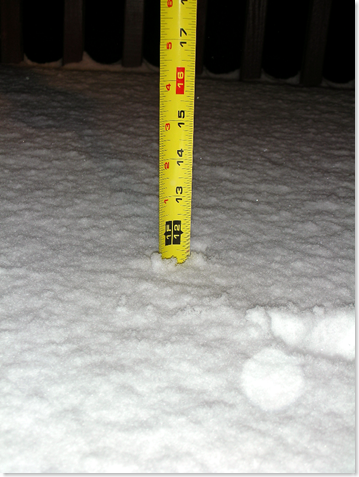 In fact, it’s still snowing. This is just from last night. (and my volunteer assistant wasn’t sure she had the tape measure all the way down to the wood) I’m ready for it to rain again. This entry was posted in Family, Mimi, Weather. Bookmark the permalink. I am actually quite envious! The snow we had is gone now. Aside from driving difficulties and the shoveling backaches, snow is FUN and it’s pretty. I think the snow is pretty! That said now let it rain, rain and rain some more and wash the snow and cold away. I am tired of being stuck on this mountain side! John left the other day and when he came back, he had to take three runs at the hill to get the car to go up the hill. I was thinking of tying him to the recliner so he couldn’t go out again. We are waiting for our … uh, “Norwester” (?) here in Salt Lake City. It was supposed to start overnight, and now the sky is so heavy that I fear it might drop hunks of iron instead of snow. Winter is so awesome. White Christmas = perfection! Let it rain, let it rain, let it rain! 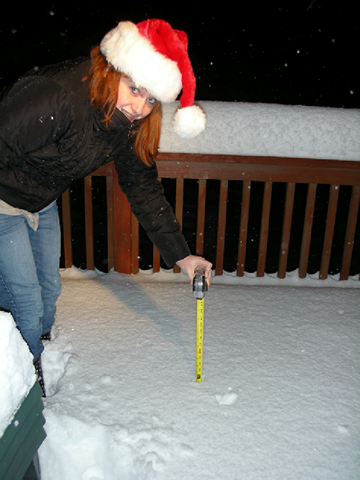 We measured our snow in our yard last night and it was at 21″. It’s still snowing. Will the madness ever end? I’m jealous of the snow. I want to have a white Christmas. I would love to wake up Christmas morning to that snow. The kids would flip!!!!! But then I want it all to go away by the next day and have our sun and warmth back. Is that too much to ask? I haven’t left the house in far too long. HELP. Peggy~I agree, snow is fun and pretty…but only for a day or two! Mom~I had to work hard to convince Shaun not to go out again last night. You’d think he’d learn his lesson after his near misses the other day. Men! 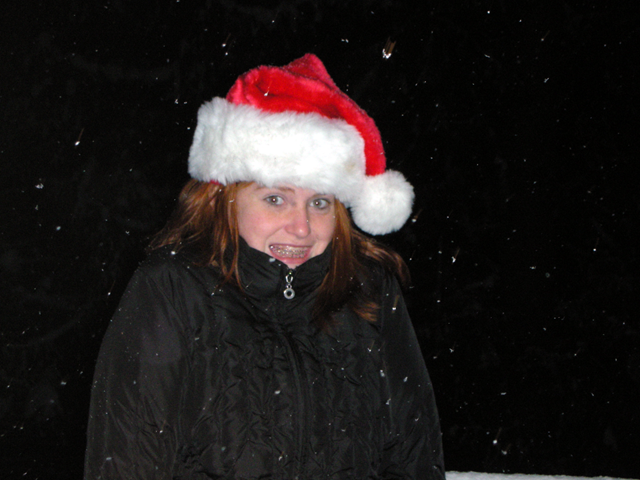 Hi Erin~Um…you can have our snow…I’m pretty much done with it! Michelle~Yes! Bring on the rain and wash our roads clean. Jay~You can have whatever Erin doesn’t want. Believe me, there is plenty to go around. Linda~No, I don’t think that’s too much to ask. That’s usually how our snow works. Although it doesn’t seem to do such a great job of landing on Christmas. Heather~I’d send a dog with a flask, but the wimpy dog doesn’t want to get her feet cold. Um…I’ll drink a toast to you, ‘k? Marla~As long as the power stays on, we will! Is Mimi trying to bury the cat? 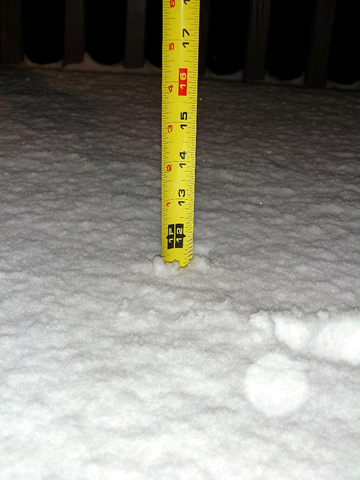 OMG, that is so much snow!! World’s away in season’s we are, now it is Summer here! I love the blog snow falling while I’m reading about snow. But personally, I’ve had my fill of my white stuff for the winter. I heard that the wind hit Enumclaw? My grand niece lives there. Glad you guys didn’t get it again. I saw Seattle on the news last night and thought about you! Even tho I’m sick I had to stay on the computer long enough to leave you a comment. We have about the same amount of snow on the ground but now tomorrow we are supposed to get heavy rain. I hope it doesn’t wash it all away. You send me your snow and I’ll send you my rain, deal? lol at Tink’s comment. Those photos are cute.. Santa’s hat was made for that adorable redhead. 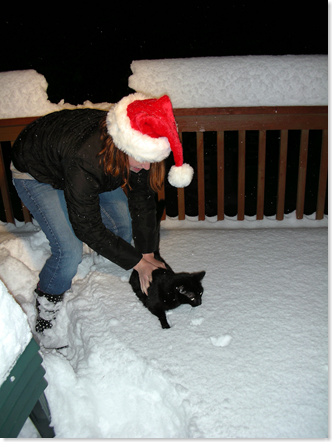 My cat thinks he wants to go out, but stops dead when he sees the snow, then tries to walk on the dry patches. He’s quite amusing to watch. Wishing you and yours a very happy and healthy Christmas holiday. I must say that I am glad that you stopped watching the pot! I love the snow, and have really missed it since we left Utah. Plus, it looks like we might get a white Christmas! My nephew’s not going to be home for Christmas–he’s snowed in in Portland–whouda thunk it? Tylor~You just never know with that kid. Cazzie~Sigh…I’d catch a plane, but I’m pretty sure the airport is still shut down. Pamela~I heard it was really bad there. I hope you G-Niece is doing ok.
Tink~lol, thanks for the much needed laugh! Q~Flurries are pretty much paralizing to us too! Jenn~I’m sorry to hear that. I understand Portland got hit a lot worse than we did. Jeff~Be careful what you wish for! See. now you know how life is here in North Dakota…only it is windier and sub zero here! Actually, today was a balmy 27 degrees…I almost broke out my bikini! Merry Christmas to you and yours! Merry Christmas and Happy New Year Susan, I hope that your weather is currently better and that 2009 and is wonderful year.